For most people, the cheaper parking quote can often look like the best deal - but there's a host of other factors to think about. Those could be the unexpected if you suddenly have to cancel, if you need to amend your booking, or simply the cost of calling up to make the booking. That's why Airparks are there to not only give you the cheapest airport parking quote, but also to make sure our customers get the best quality and value service too. Airparks are not here to rip you off, to sting you with hidden charges or to try and make hidden profits on premium phone rates. But how? We put our customers first and we're proud to park your car. Here's seven reasons why Airparks not only bring you the lowest prices, but also make sure our customers don't suffer in other ways too. 5) Best Price Guarantee. 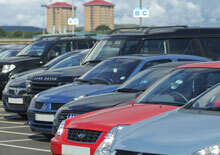 We offer you the lowest price on UK airport parking. But of course, if you find an identical product any cheaper, anywhere else (and we challenge you), we'll be happy to match the price or refund the difference within 24 hours. Check out our airport parking page and make your booking with Airparks for complete peace of mind.